Communication is an important soft skill for product designers. In Discussing Design, Adam Connor and Aaron Irizary discuss the importance of critique in the design process. You can improve as a designer by delivering useful feedback to other designers. The same way teaching is a great way to solidify knowledge, delivering useful feedback requires you to think about different aspects of design and organize your thoughts. What kind of critique is useful? Let’s take a look. People complain that Dribbble feedback isn’t useful for finding flaws and improving design. “Good job” and “Great work!” aren’t specific at all. A lot of time, the work shared on Dribbble is a detail shot or some other form of a very small part of a larger project. There isn’t enough shown and sometimes there isn’t an objective at all to relate critique to. You should be basing design decisions on objectives and best practice. When starting out, it’s good to lean on best practices to build out something that mostly works. It’s okay to stray away from best practices if your solution works better for a project objectives. When critiquing, think about design aspects that are going against objectives or best practices. Otherwise you might simply be saying that your arbitrary choice is better than their arbitrary choice. Good critique requires effort on both ends. Presenting something while also explaining all the factors involved — constraints, timelines, background info — takes effort. Parsing this info and fully understanding the problem being designed for also takes effort. Combined, this is probably why there’s not a hugely popular community for useful design feedback. If people took the time to do that on Dribbble, it wouldn’t be a light, fun place to go to. It wouldn’t be Dribbble. Feedback that doesn’t nail these three elements might fit into another category. Let’s take a look. Discussing Design describes three types of feedback: reaction-based, direction-based, and critique. With reaction-based feedback, the answer to these questions is usually “no”. Sometimes you might hit the three elements of critique and it still won’t be useful. How come? The timing might be off. Engineering won’t have time to incorporate design improvements after the 20%–80% sweet spot. Before the sweet spot, it’s better to continue creating without stopping for critique. How come? Each task requires a different mindset. 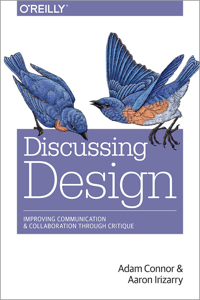 Discussing Design lays out some techniques to facilitate effective critiques. In the Google Ventures design sprint methodology, diverging and deciding are separate steps. Teams generate as many ideas as possible with mind maps and Crazy 8s. At the end, participants select the best ideas based on the objectives. Quality: Objectives and best practices are your guiding light for effective critique. Timing: Critique is most useful when it takes place during the 20%–80% sweet spot. Mindsets: Creation and critique require different mindsets and should be separated. Embracing critique and following these principles will help you be more effective in delivering and receiving critique.